Last week I attended the European Conference on Rare Disease being held in Edinburgh*. It was three days of listening to presentations about developments in rare disease research and medicines and meeting new people and those I'd only previously met online. Approximately 3.5 million people in the UK are affected by a rare condition. This post however, is about how those working in SEND (Special Educational Needs and Disability) can learn from the work that is being done in rare diseases around collaborating with patients and their carers, of whom many are parents. The #ECRD2016 conference was organised by EURORDIS, an umbrella patient organisation that represents more than 700 rare disease-related charities and patient groups across Europe. Genetic Alliance UK, where I'm a Trustee, and of which SNJ is a member, is one of them. It's a pretty massive conference, attended by 800 patients, their representatives, health professionals, researchers, providers, pharma and pretty much anyone who is involved in the fight against rare diseases. The theme was 'Game Changers' and every session, from the keynote to the workshops addressed an aspect of importance to improving care for rare disease patients and those who support them. It also looked forward to anticipate future needs to ensure that technology advances are used to their fullest. The needs of the patient were central to every discussion and there was complete understanding that you cannot develop sustainable solutions without ensuring that they serve the needs of the patient and family. This is how it should be in SEND, but it isn't or at least, it isn't yet. I know this is the aspiration of the Children & Families' Act, but the figures released last week that England's Education and Health Ministers spoke of on SNJ, and that @AspieDeLaZouch demolished, show that we are far from there. Co-production - parents and young people designing services alongside providers - is patchy and parents do not often feel that they and their children are central to the process. A lack of money is real but isn't an excuse. In many ways, it's nothing to do with money, it's to do with a desire to put the end-user at the heart of the process to really make a difference in improving their lives. If you're designing services to fit with what works best for the provider and their staff, then something that actually meets needs will only ever by accidental. I'm under no illusion that just because I've seen some great work and innovation concentrated in one place over a few days, that this level of collaboration is happening as a matter of course, any more than it happens in SEND. But the posters on display show that they are not just good ideas, they are projects that are happening in practice. I especially liked this one about "Developing digital tools for improving patient and family engagement in paediatric clinical research" for Muscular Dystrophy, that would be as useful for parents as for children and is a good example of making a complex subject accessible. I do believe we are slowly moving towards better collaboration and the desire at decision-making and family level is definitely there. The challenge is not even in reimagining service delivery, there is plenty of imagination to be seen both in rare diseases and in SEND. The challenge is in the bit in the middle, to embed a collaborative approach to systems and departments that work as silos and where the family's needs are a still a bit of an inconvenience. It's to bring flexibility of thinking to those who want to do things a certain way because that's the way they've always done them. It's not only to introduce new ways of working where the child/patient/family is at the centre, but to provide the training and support so that this can become something real, enduring and accepted practice. Maybe it's time for a another European Conference on Childhood Special Needs and Disability (or ECCSEND !) along the same lines as ECRD. (Or even a UK and Ireland one - no need for language interpretation, if it's more in reach). I say another - there is already a European Agency for Special Needs and Inclusive Education (Did you know that?) and they did have an inclusive education conference back in 2013. It's EU funded however, and that's another story, right now. 'Inclusive' though, is about being included in society, rather than in one setting, and there are many amazing ideas, research (especially this), good practice and inspiring initiatives already being put into practice in pockets across the country or continent that could be adapted and used more widely. Yes, taking that learning back and put it into practice- the tough bit! We do have lots of conferences but they are on the whole, less accessible for parents and people with disabilities because of cost*. They are not as big-thinking, and could do more perhaps, to harness the power of industry - and there is certainly a pharma interest in this area as so many of our children are reliant on medications that make drug companies rich. The NHS is a key player here too. There are enough big thinkers in SEND to make it happen with lots of collaboration all round. 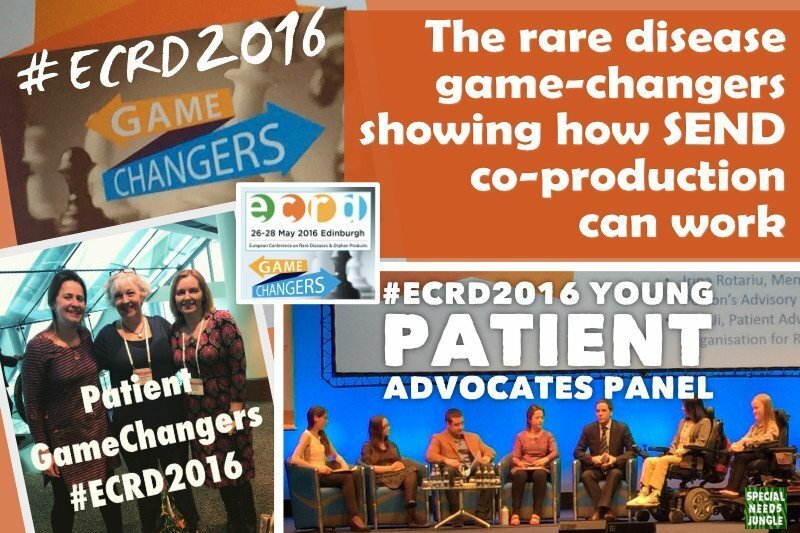 It's definitely possible - just ask EURORDIS about its 8th ECRD. It couldn't have done it alone and it didn't, but the result was a fantastic event where it was impossible not to learn and be inspired. I realise a conference won't make people in positions of responsibility just do what the law says they should, but this is about thinking big for all of us. We need this kind of thinking in SEND and our children deserve it. How can we make it happen? Get in touch with your ideas. 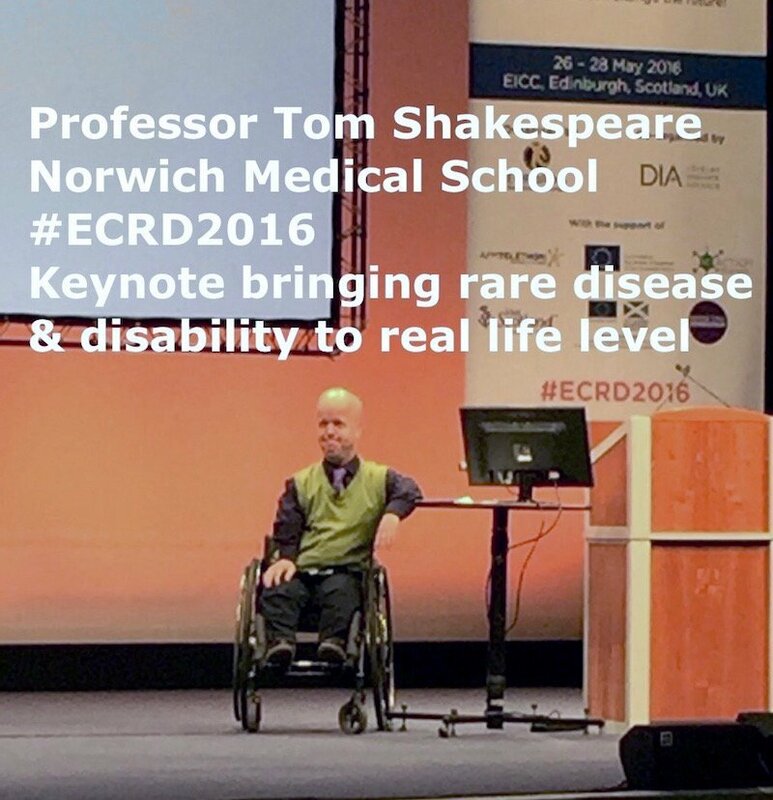 *I went to ECRD with expenses paid as a EURORDIS Patient Advocate Fellow. How awesome is that?